This ensemble was inspired by one of the outfits I wore last week. I combined my Rag & Bone wide cropped jeans with a white cropped lantern sleeve pullover, white loafers, Spring citron scarf, citron bag and sea foam jacket. The effect was crisp, fresh and insulating for a chilly Spring day. Here are the exact items from my wardrobe. Combine these colours in any way at all. Note that denim works well as the shade of blue. Mint can be used instead of sea foam, and metallics look fab thrown into the mix. Here are some ideas to get you started. The ensemble on the left approximates what I wore. It worked as well without the jacket, so feel free to leave out the sea foam if that’s more to your taste. Or leave out the citron and have a slice of lemon loaf instead. Combine a pair of blue jeans with a white top that works with the style of the jeans. Add white or metallic shoes. 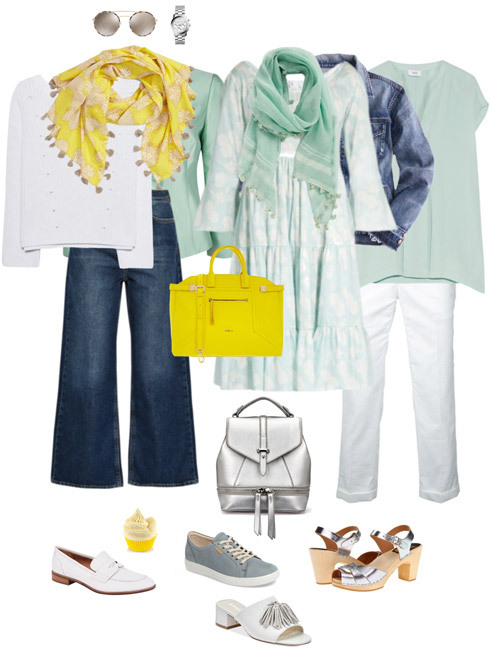 Finish off the look with citron scarf, a bag to match and sea foam topper. Alternatively, layer a white jacket over a sea foam top. Combine a mint dress with a blue or white denim jacket. Add a citron bag, and finish off the look with white, silver or light blue footwear that works with the style of the dress. Adding a scarf in the colours of the palette is optional. Combine white chinos or jeans with a sea foam or mint top. 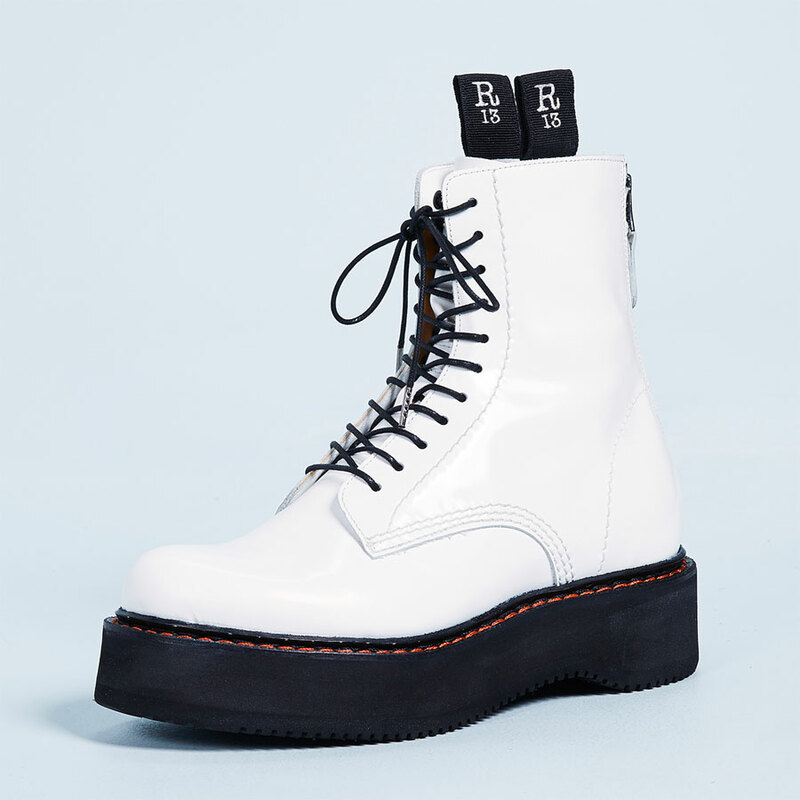 Add a light blue blazer or denim jacket, and finish off the look with white or silver footwear. A citron bag and scarf would be nice. But if citron isn’t your colour, sport mint with light blue and sip on a tall glass of fresh lemonade instead. Add jewellery, watch and eyewear as desired. What a lovely color combo, Angie, very springy. I like all the versions. I do not have that much seafoam, but I do have a lather jacket similar to yours and a mint silk blouse. I have even less citron, but one of the two pieces I have is perfect for this ensemble: it is a citron Equipment sweater with front silk panel in white and light blue. I am going to try to put together an outfit similar to the first ensemble with that sweater. Charming! Love the combo, so fresh!!! What a lovely color, very springy.I like all and will shop my closet for some of them. I don’t have any sea foam – but now I want something in that colour! This is such a lovely and fresh look. So pretty and springy- this is one look I would love to try! I can just imagine how crisp and pretty this color combination looks on you, Angie. Thank you for the inspiration. I have a pair of cotton pants that are close to seafoam, so you have given me some good ideas on how to wear them. I find them difficult to style sometimes. Such a beautiful, crisp palette for a warm day. I have all the components except for the citron, so I’ll take the lemonade option! What a fresh and pretty combination, Angie! I can just imagine how lovely you looked in that. I’d like to try a version. I have no lemon or citron at the moment but am considering some accents in that range. I love this combination and am attracted to mint or seafoam whenever I see it, but anytime I’ve added anything yellow to my wardrobe it’s never gone well. I can get a hint of citron/yellow in a printed scarf, perhaps. Sip on a glass of lemonade to add citron to your outfit! Ha!! Good one — and an excellent tip as we head into the long weekend. Love these colors together, Angie. I lack seafoam or mint, as well as citron in my wardrobe, so will enjoy the this on others. Like the power of white in these looks, and how the citron amps it up. Well played! What a pretty color combination! Very “Angie”. Makes me want to try. So pretty! Seafoam is a color that is too cool for my warm hair tones, and I don’t love bright citrons, but If I slightly modified to pale blue and a buttery yellow I would LOVE this. That yellow color is a huge HEWI for me, I’m hunting but have NOTHING i that color but I will remember this ensemble for when I do find something. These are perfect colors for you Angie! Hope to see some other fabber’s outfits in these colors, they are such happy springy colors. Very pretty and fresh looking color combination. I need to venture into wearing more colors together. I’ve always had a soft spot for mint/seafoam green. It’s not easy to find and I am babying a favourite soft mint silk and linen sheer cardigan that I think must be 10 years old by now. I love the use of a citron bag here too – another piece I have coveted since joining YLF but have yet to find ! I like the enthusiasm, this morning. Tanya, don’t you wear mint? Or have I dreamt that? Enjoy some lemon loaf instead. Bijou, go for it. Sea foam is pastel teal – your favourite colour. Inge, I thought the same thing. With the chartreuse bag! Exciting. Joy and Sisi, what a sweet thing to say. Thank you. Hope you try it too. Aquamarine and Janet, sounds great. Suz, thank you – enjoy a slice of lemon loaf instead. Laura, throw in some lemon sorbet too. It’s going to be glorious warm weather in Seattle. Chris, nice substitutes. Go for it. Lisa, do you wear the mint cardigan with a white top and blue jeans? Minnie, personally, I think it's always worth trying new colours that you're attracted to. Angie, I do wear mint and quite like it. It is just that I never had that much of it to begin with and then a lot of those pieces got fairly worn and retired in the past year or so. So I am left with couple of pieces only at this moment. I love your leather jacket. It’s so pretty. I think this combo is beautiful, but I don’t have seafoam or citron. Oh I love sea foam and mint. I’m down to one pullover unfortunately that is too hot to wear today, but I’ll remember this ensemble for another time. Cute! Angie, I bet you looked So Fab! When are we going to get to see photos of you again? Miss your outfits! Love the citron white and blue combo! Sea foam? So risky. It can look old-fashioned if not the right shade. Colours are very personal! Lovely combination. However, I do not have any seafoam or mint in my closet. I like how it looks on others, but not very much on me. Citron I do love and own a few pieces. I am going to try the first outfit minus the seafoam jacket. This is a pretty color combo! I don’t really have much seafoam or citron though, so I’ll have to enjoy it on you and others. 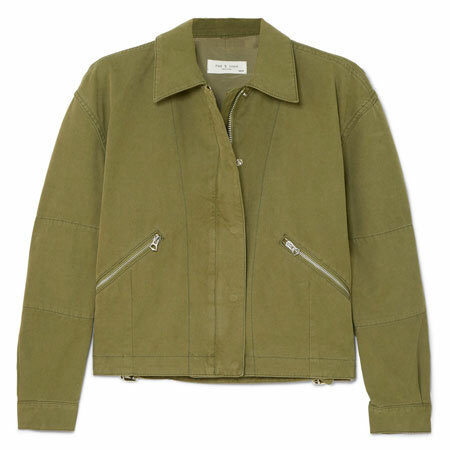 Hello jacket twin and I know you looked gorgeous just seeing all these items assembled here. 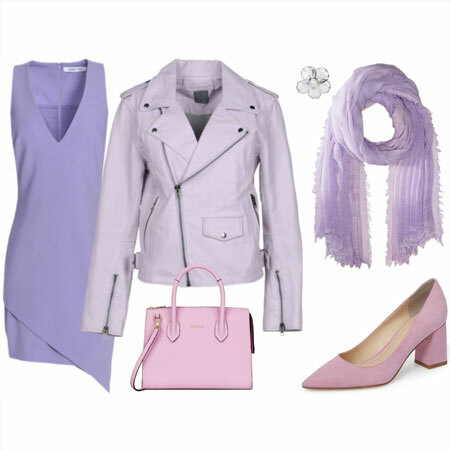 These are refreshing spring colors that would make anybody smile, wearing them or seeing them. I’d love to know how you got your jacket over those lantern sleeves! 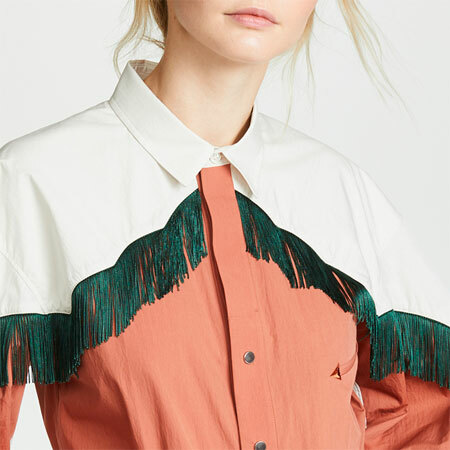 I have the worst time with layering mismatched sleeves–it seems that most of my tops have deeper armholes or wider sleeves than my jackets do. My mum thinks sea foam is my green, hehe. I love the citron with it. Citron does indeed add a bit of tartness, which is important for balance to me. Hmm, I don’t wear citron, but I do wear everything else in this ensemble idea. I have a mint dress and jeans jacket so I’m halfway there. Will have to wait until after my little holiday to try it out though. Thanks for the inspiration Angie! Thanks for the reply Angie I prefer to have a soft mint top to wear under the cardigan – keeping it tonal. That’s been a HEWI since I first bought it – (CM) – but when I do have one, the look is so pretty. And yes, with blue denim . Love this combo, so fresh and springy. Not too long ago no one would wear sea foam and chambray together, and then add citron, but it is beautiful and interesting. I haven’t been wear citron, but now I think I need to look for some citron accents. (I have been more of a lime person, which I think would look nice also.) Since I am more of a fair person, blonde/gray with blue eyes, this gives me a new direction to go with my many chambray and sea foam colored jeans and dressy pants. I already have a jacket (faux leather) in the right color, now I just need to find some citron accents that will work, right? 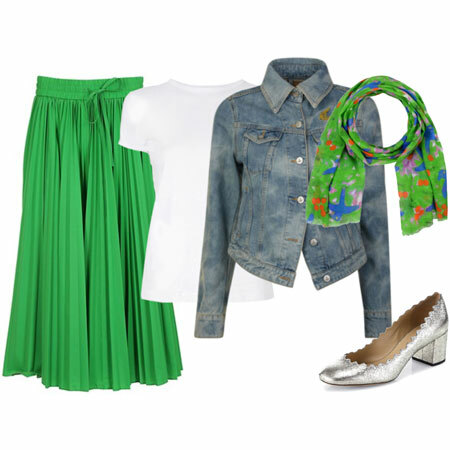 Now that would be a very cheerful outfit for a rainy spring day like today! I adore sea foam green and I think it adores me back as I always get compliments when I wear it. I must add more items in that color! Very pretty. I don’t have any mint but I do have citron. 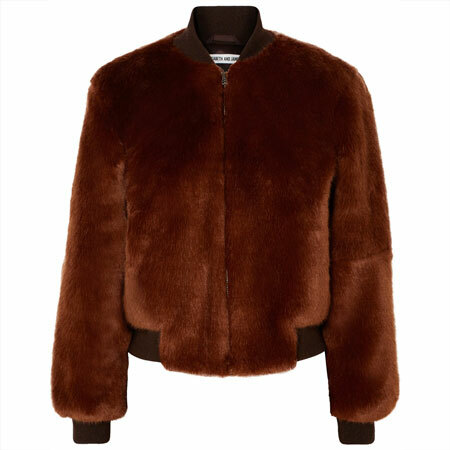 I love these colors and believe I can use pieces in my closet to come close to your styles. I don’t have (and am not likely to acquire) anything citron, but I wonder if a fuschia bag would provide that zing of color to keep the blues and greens from going too sweet and dull? The colors are beautiful – I hope I see some renditions! Pretty colours and combinations. I have a similar combo of a.yellow scarf and a yellow bag and will happily wear it with blue and white. Seafoam, however is not a part of my wardrobe. I do have a mint tank top, but prefer mixing a maximum of three colours unless the additional colours are part of a print. Oh yes, I have a long cardigan that could be called seafoam! (How could I forget it?) Anyway, I would combine it with EITHER yellow OR blue. And white, of course. Very pretty! I don’t have any seafoam, citron and not a lot of light blue in my wardrobe so I won’t be attempting this ensemble. I’ll have to enjoy the colors on others instead.